Are you a former student of Howard Zinn’s? If so, we would love to hear from you. Please contribute a story (or stories) from the classroom or campus about Howard Zinn that made an impression on you. 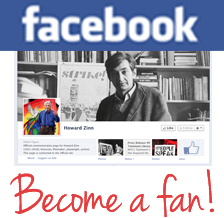 You can use the following form or send the information via email to: admin@howardzinn.org. We accept stories on an ongoing basis. If you have any questions, email admin@howardzinn.org.